We have an experienced guitar player who can teach the basics or if you need a refresher class having not picked up an instrument for a while. Please get in touch if we can help. 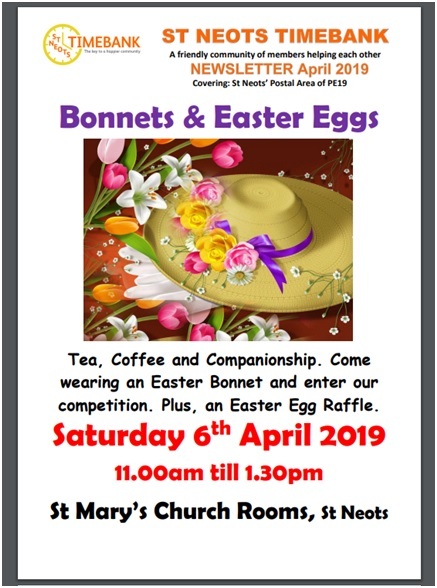 This month's Coffee Morning will take place on 4th May 2019 at St Mary's Church Hall from 11am to 2pm. At our Members' Evening on 13th May 2019 at 7pm to 9pm in the Tesco Community Room will feature our local Warm Homes Project Officer to give advice on Fuel Poverty. The Friends Group this month will take place on 17th May 2019 from 11am to 1.30pm at the Priory Centre, as usual. On Saturday 18th May we will be holding our Memory Day. Our aim is to bring together people that are on their own and maybe feel a bit distant from the daily hustle and bustle of the town centre. If you or someone you know of would like to come along, please contact the Co-ordinator. FUNDRAISE FOR US WITHOUT LIFTING A FINGER! If you shop online, please could you sign up to easyfundraising. org.uk to support St Neots TimeBank? Details of how to register can be found in the newsletter. Thank you. If you are in need of help on a return from hospital, or would be happy to help someone who does, please let the Co-ordinator know, so that you can be added to the relevant list. This is a wonderful safety net for the community that has already seen over 30 hours of help given and received. The April 2019 Newsletter is here!